Captain Isaac Powers was born on April 9, 1665 in Littleton, Middlesex County, Massachusetts. His parents were Walter Powers and Trial Shepard. He was captain of the militia and was active in civic affairs. He petitioned for the incorporation of the town of Littleton and moderated the first town meeting. He held various town offices for many years. He served as a member of the general court twice. He was the colonial agent for conveying lands. He married Mary Poulter Winship, on April 14, 1701. Mary was born in 1668. 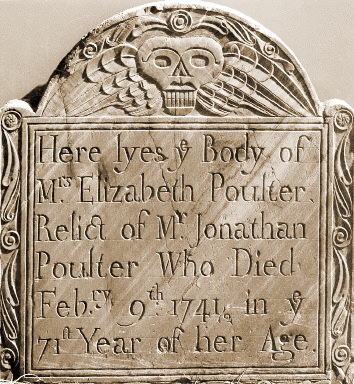 She was the daughter of John Poulter and Rachel Eliott of Medford. Mary was the widow of Samuel Winship of Lexington. Samuel was born on October 24, 1658 and was the son of Lieutenant Edward Winship and Elizabeth Parks. Mary and Samuel lived in Lexington and had at least one son, Samuel Winship, Jr. Samuel, Sr. died on June 18, 1695. Isaac Powers was appointed as Samuel, Jr.'s guardian. Ephraim Powers, and Mary Powers Davis (1724). The Powers Family by Amos Powers has both Mary the daughter of Joseph Powers and Hannah Whitcomb (p. 24) and Mary the daughter of Captain Isaac and Mary Poulter the wife of Simon Davis, Jr. (p. 15). Isaac was a member of the committee which assigned seating in the meeting house when it was completed in 1723. Isaac died in 1735. Mary died in 1743. Middlesex County, Massachusetts was created on May 10, 1643. The county originally included Charlestown, Cambridge, Watertown, Sudbury, Concord, Woburn, Medford, Wayland, and Reading. Who was a pattern to us all. Samuel Winship, son of Lieutenant Edward and Elizabeth (Parks) Winship, born October 24, 1658, was a resident of Lexington all his life. He was selectman of the town, and subscriber to the meeting house and for the purchase of the common. He married, April 12, 1687, Mary Powers [sic Poulter], of Medford. (He died June 18, 1696). Lieutenant Edward Winship, son of Lyonel Winship, was born in England, March 13, 1612-13, died in Cambridge, Massachusetts, December 2, 1688. He arrived in Boston October 3, 1635, on the ship Defence, which sailed from Harwich, August 10, 1635, and he settled in Cambridge. In 1638 he purchased land on the corner of Mason and Brattle streets, extending to the commons. He was for many years an energetic citizen, a member of the Ancient and Honorable Artillery Company of Boston, 1638; commissioned ensign of the Cambridge militia in 1647, lieutenant in 1660; deputy general of the court in the Massachusetts Bay Colony in 1663-4 and 1681-86. He married (first) Isabell, daughter of Jane Wilkinson, and she died February 28, 1656. He married (second) in 1657, Elizabeth Parks, who died in 1690. Which gives us cause for children's sake to weep. Isaac [Powers] m. 2d Apr 14 1701 Mary Winship of Cambridge, widow of Samuel Winship and dau. John Poulter of Medford. Samuel Winship [Jr.] nominated his beloved father in law I. Powers of Cambridge Farms for his Guardian during his minority. . .
Isaac [Powers], born 1665, married, April 14, 1701, Mary, daughter of John Poulter and widow of Samuel Winship Sr. Isaac Power was captain of the militia, a petitioner for the incorporation of the town, moderator of the first town meeting, held various town offices for many years, was twice a member of the general court and was colonial agent for conveying lands. With his brother, Walter, he was on the pew committee to convey pew-rights in the meeting house when completed in 1723. His wife and the wife of Benjamin Shattuck, the first settled minister of the town, were of the same family. The Poulters were of German descent, although they came to this country from England. John Poulter was from Raleigh, Essex. In 1668 he bought an eight acre right in Billerica and lived there until the beginning of King Philip's war in 1675, when the family went to Medford, where John died, September 18, 1676. His first wife, whom he married December 29, 1662, was Rachel, daughter of Francis Elliot, of Braintree, Massachusetts. Their son Jonathan [Poulter], with his brother, John, (said to have been his twin brother), appeared at Cambridge farm in 1693, and he and his wife Elizabeth [Coolidge] were admitted to the church in Lexington in 1697. King Philip’s War was a bloody and costly series of raids and skirmishes in 1675 and 1676 between the Native American people and the colonials. King Philip was the Native American leader Metacom. Gideon [Powers] m. Lydia Russell. He probably lived in Lexington, as his name appears on the rolls of that town as a soldier in an old French war. Lydia, his wife, was a sister of Nathaniel Russell, Esq., and probably daughter of Deacon David Russell of "Nashoba Farms."